5793 labyrinths found. Showing 1181-1200. Sorted by country, state, city, then zip/postal code. 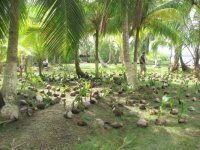 Coconut labyrinth located near dock. On private property but anyone is welcome. Modified 7 circuit labyrinth with circle in center. 9 12 29.01 N° Lat. ; 82 14 58.45 w° Long. 8 34' 59.88"° Lat. ; 80 7' 59.88"° Long. Located at a private bed and breakfast. B&B guests are always welcome to use it, others please call for availabilty. 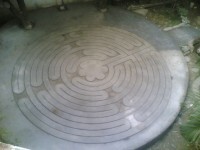 Classical labyrinth made from river rock near pool area, and second turf labyrinth on riverbank. 12 deg. 4m. 3.0° Lat. ; 77 deg. 2m. 23.° Long. The Labyrinth with Lake Titicaca in the background. 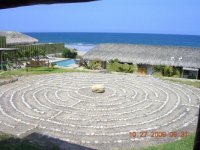 The labyrinth at Origenes was created as a relaxation tool. With each step your mind relaxes bringing inner peace. One and a half hour flight to Talara, north of Peru. 45 minute taxi driveTaxi drive from Talara to Origenes Beach Spa at Vichayito Beach. Please call to make sure someone is there to assist you. Any day of the week 9am to sunset. We have lodging facilities as well. Baguio City is the summer capital of the Philippines, situated in the province of Benguet. It is about 250 kilometers north of Manila and easily accessible by public or private transportation. Mirador Jesuit Villa and the Lourdes Grotto are landmarks of the city and well-known to drivers and tour operators. To get to the Villa from downtown, travel along the road that links to Naguilian Road, after the welcome arch at the beginning of Naguilian, turn left at the first turn. You will see a whitewashed flight of steps that lead to the Lourdes Grotto. There is a winding road that leads up to the grotto and beyond to the Mirador Jesuit Villa. The last stretch of road up to the villa may be blocked but can be opened if you indicate that you are going up to the Villa and are expected. 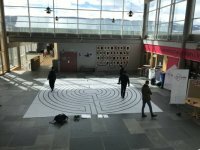 The labyrinth is open for retreatants at all times of the day. However, other guests are limited to the daytime hours 8:00 AM to 5:00 PM. Baguio City has a long and harsh rainy season lasting from mid-June to October. 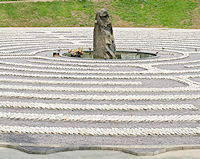 While the labyrinth has been designed for use even during rain, heavy downpour may hinder walking the labyrinth. 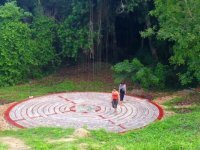 Appointments necessary, we can also conduct free orientation for groups or individuals who may want to visit the labyrinth. Davao City Archbishop Capalla reading the Labyrinth's spiritual meaning as an ancient sacred meditation tool for reflection. From South Express way, go to Pagsanjan Laguna, on the way to Lucban,Quezon, and ask for directions from local people. It's about a 4 hour drive from Manila International Airport. A former school run by the order of the Good Shepherd, Maryridge is now a Retreat Centre for Healing & Renewal. It has panoramic view of the Taal Volcano and Lake View. FAITH is an educational institution located in the City of Tanauan in Batangas. 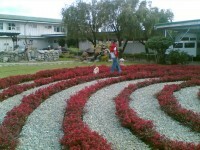 The FAITH campus is one of the most beautiful school campuses in the Calabarzon region (South of Metro Manila) with its charming gardens and recreational areas. It is accessible via the South Luzon Expressway (Batangas Exit), the President Laurel Highway/National Road and the Southern Tagalog Access Road (STAR) Tollway (Tanauan Exit).